In a small study, US researchers found decreased blood flow in bulimic women to a part of the brain involved in self-critical thinking. This supports the idea they may be using food to avoid dwelling on negative thoughts about themselves. Bulimia usually leads to binge-eating and then purging, through vomiting. It is an eating disorder and a mental health condition that means people have an abnormal attitude to food and body image. Psychologists have long thought that binge-eating is triggered by stress and gives women with bulimia a way of focusing on food, instead of being critical of themselves. This is the first study to look at what happens in their brains. Writing in the Journal of Abnormal Psychology, Washington researchers scanned the brains of 20 women - 10 with bulimia and 10 without - while carrying out experiments. They fed them all the same meal before showing them a series of neutral pictures followed by pictures of high-sugar or high-fat food, such as ice cream, pizza or brownies, while having their brains scanned. To make them stressed, the participants were given an impossible maths problem to solve - then they were shown different photos of sugar and fat-laden food and asked the rate their stress and food craving levels. Although everyone said their stress levels had gone up and down at similar times during the tasks, the brain scans had shown very different results, the researchers said. For women with bulimia, blood flow to a region of the brain called the precuneus decreased when they looked at food pictures - but in women without bulimia, it increased. And in a second study, involving 17 different women with bulimia, the results were the same. The researchers say the decreased blood flow is a sign that thinking about food shuts down thoughts about their own shortcomings in those with bulimia. Ms Fischer said the findings could help women to control their binge-eating triggers. "We found that it doesn't take much stress to trigger binge-eating," she said. "I would love to see if teaching basic emotion-regulation behavioural skills works for some women. "For others, they may need medication or trans-cranial stimulation to stop the rise in stress before they binge." 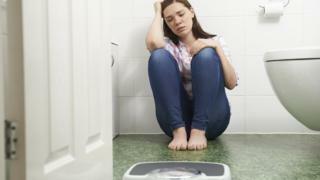 The eating disorder charity Beat said the first port of call for people looking for help was to visit their GP. The GP may then recommend online support or cognitive behavioural therapy (CBT) and sometimes medication.